Summary: Leaking shower pans, tile walls, deteriorating grout and mold are common problems for college housing facilities. Once water seeps under the pan, it can easily damage drywall and floors below. Miracle Method Surface Refinishing has developed a time and budget saving process that eliminates the need for expensive re-grouting and retiling of dormitory showers. The process is be used by a number of universities and touted by college facility managers. Whether it’s during a visit by a prospective student and his family or during a parent’s weekend, a leaking, moldy or just plain dirty shower can create a negative impression of the entire university. No matter how great the academics, the campus or the football team, a dirty shower in a college dormitory may be all that is remembered by the “paying customers,” the parents. “In these times of budget cuts, college facility managers welcome an affordable and lasting alternative to ripping out old tile showers and pans in order to install new ones,” says Chuck Pistor, President of Miracle Method. Maintaining individual and group showers in university housing is a challenge. They are in constant use. 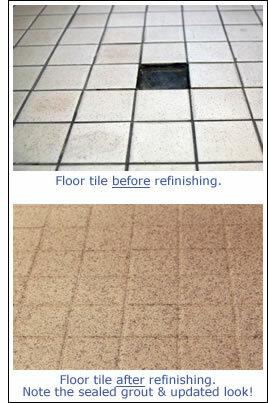 Shutting down a residence hall floor to re-grout or retile showers is time consuming and very expensive. Miracle Method, the nation’s largest surface refinishing company, has developed a permanent solution that costs a fraction of replacement and can have leaking showers back in service in 24 hours. “A year of use in a dorm is like ten years at home. Students are very rough on all elements of the building,” says Joe Chaparro, Special Projects Coordinator for Housing, Florida Atlantic University. Florida Atlantic opted for Miracle Method’s solution based on cost and the results of a test. “We were very confident after seeing a demonstration,” adds Chaparro. The process involves cleaning the tile and grout, removal of mold and mildew, re-grouting, and the use of a proprietary sealant. After sealing, the surface is refinished in one of Miracle Method’s Natural Accents™ stone finish colors and clear coated with a hi-tech acrylic. The end result is an attractive waterproof shower pan and tile surface that is easy to maintain and effectively resists mold… no more “black” grout. Miracle Method uses a proprietary high tech epoxy that cures underwater to create a permanent, waterproof free barrier. It actually penetrates into the grout and displaces any water trapped under the tile. “Once treated, the grout will never crumble again, or leak,” says Eddie Naro, whose Miracle Method office performed the work at Florida Atlantic University. “The combination of time and money saved is compelling… and maintenance costs have been dramatically reduced to less than 10% of what they were before. It has proven to be very durable and after nearly a year of use, there is no scratching, gouging or peeling,” says Chaparro. Miracle Method is a member of APPA and ACUHO-I and attends major college Facility Manager conferences. To learn more about Miracle Method and to read case studies, log on to www.miraclemethod.com/collegehousing, or call 800 444-8827.